Georgetown, Guyana. 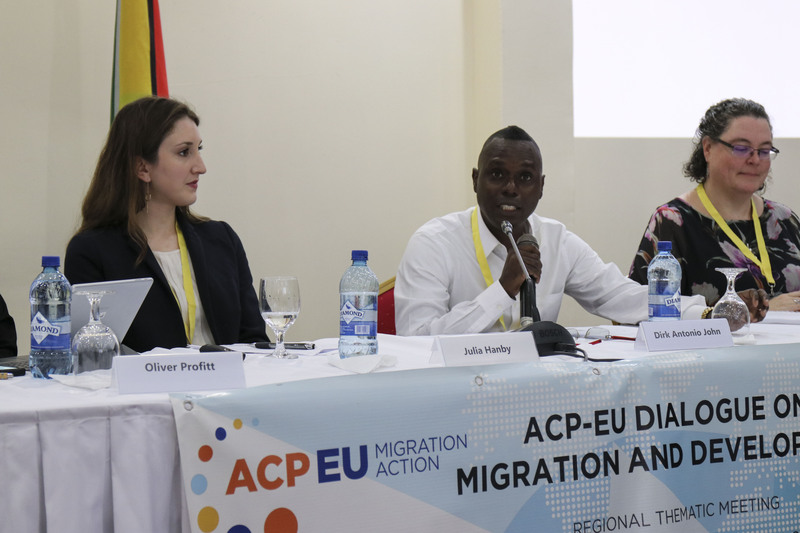 As part of the three-day Regional Thematic Meeting on Counter-Trafficking and Smuggling of the ACP-EU Migration Action March 12 to 14 in Georgetown, Guyana, the Caribbean Migration Consultations (CMC) Counter-Trafficking Network held a special session to continue the discussions that began in Trinidad & Tobago last year, when the Network began. During this second meeting of the regional CT network, new ideas and recommendations were generated on how to further collaboration on counter-trafficking in the region. The CMC CT Network focuses on counter-trafficking efforts comprehensively, including both law enforcement efforts and protection and assistance actions. It is also unique in the region, bringing together not only CARICOM member countries but also other States and territories. Participants noted the importance of cooperation across the entire Caribbean, and with key actors such as CARICOM IMPACS. The first part of the special session of the CMC CT Network was focused on counter-trafficking information and data sharing, which included a presentation of the recent IOM Migration Governance in the Caribbean report and its mapping of counter-trafficking efforts in ten different countries of the region, as well as a presentation which shared the experience of a similar regional CT coalition in Central America to produce regional CT data with the support of IOM. The second part of the session was focused on current trends in the Caribbean, specifically the flows of Venezuelan migrants, and how they are impacting national counter-trafficking responses in some parts of the region. Experts from Trinidad and Tobago, Guyana, Curaçao and the Dominican Republic shared their experience and discussed current actions. Establishment of a regional CT information-sharing working group – which aims to gather some of the counter-trafficking statistics already being produced at the national level, and to collate them into a regional information brief. Establishment of a Venezuela flows working group – which aims to exchange good practice on how counter-trafficking responses in affected countries are handling the challenges currently being faced, which include high levels of vulnerability, sufficient shelter options, residency and work permit options, longer stays, and increased cases, among others.